Missing iPhoto on your iPhone/iPod Touch? 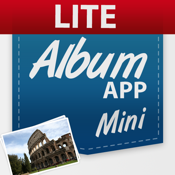 Album App Mini is designed to create full featured digital albums. In a matter of minutes you can create a complete album, or work at it for hours. After a lot of user feedback we have implemented lots of new features to edit albums, but also sharing has become effortless now with the build in tools trough Facebook, Twitter and E-mail! Extra Content is now available and there will be lots more in the coming time. New themes, functions and services to make Album App a must have for every iPad owner! We love our products and constantly work on them to improving the user experience. On our product website (www.dreamix-studio.com/albumapp) we have a poll with expansion options. Themes, layouts, or new features will be up for votes in the future.